Egyptian Labour Corps members engaged in anti-malaria work at Wadi Guzze. At the conclusion of the war, Lieutenant ST Parkes, O.C. 8th Sanitary Section produced an unpublished manuscript in 1919 called 8th Sanitary Section, AIF, History 19 July 1917 to 22 June 1918, which included a section specifically related to the battle of Beersheba and is extracted below. 28/10/17 - The division moved out to Khalasa. Inspectors and Egyptian Labour Corps members return to camp at Shellal. 29/10/17 - Inspectors with Egyptian Labour Corps labourers close up the camp sites vacated by the Division. Owing to the fact that working parties engaged in the anti-malaria work in Wadi Guzze had marched out, the work had to be discontinued but four other ranks from the Section were engaged on oiling the pools. The cleaning up of vacated areas was completed by this time. 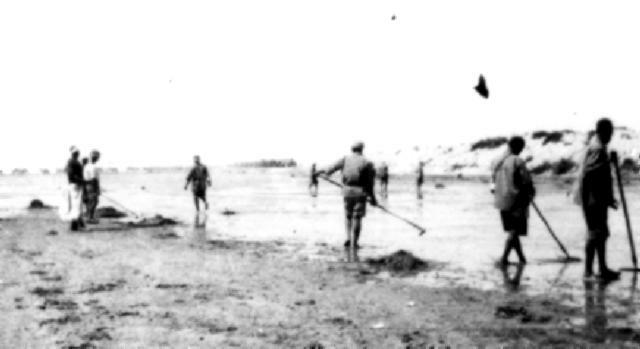 18/11/17 - The Officer Commanding and fourteen other ranks mounted, one GS Wagon, and 39 Egyptian Labour Corps members on foot marched out from Shellal to rejoin the division. The rate of march was determined by the Egyptian Labour Corps members on foot. The remainder of the section proceeded to Gaza.